First step : don’t. Reconsider. There really isn’t an alternative ? Using something else that is already installed ? Sweet-talking your sysadmin into doing the installation ? Giving up that particular task ? Giving up Computer Sciences altogether and moving to the country to raise pigs ? Ok, so you really don’t have an alternative. May the gods have mercy on your soul, because Linux won’t. By necessity, this won’t be a step-by-step guide, because each system has its quirks. I’m not promising you heaven, just a tolerable purgatory instead of a living hell. There’s a reason why installing software from sources is so painful : dependencies. Sure, you just want to install Caffe, or Torch7, or Theano. But Theano needs python, python needs openssl, openssl needs… it’s endless. High-level package managers like apt-get and yum are so popular because they deal with those. When installing from source, you’re on your own. But here’s the catch : when installing from sources, you can almost always relocate the software to your ~home, bypassing the need for root access. High-level package managers, at least the current generation, can’t relocate. Homebrew was created as “the missing package manager for OS X”, and is required to do anything interesting on a Mac. It was designed around two principles : installation at the user home, and installation from sources. Say that again ? Installation at the user home, without need for root. From sources. Wow. If only there was a version for Linux ! Enter Linuxbrew. Homebrew concept was so successful that, in an ironic turn, it’s now becoming “the missing package manager for Linux”. So, case closed ? Hardly. To start, Linuxbrew has dependencies of its own, and you have to take care of those by hand. Then, the software you want to install has to be available as a brew “formula” (but the list is quite comprehensive, and growing). Finally, it doesn’t always goes smoothly. Linuxbrew is a much bumpier ride than Homebrew/OS X, at least for now. Most formulas will install without issue, but a good 20% will require tweaking, googling, and deciphering forum posts. …or if you’re unlucky, using Linuxbrew to install the desired software dependencies, and then installing the desired software by hand. Linuxbrew has, fortunately, few dependencies : Ruby, GCC, Git, and… Linux (duh !). It runs on x86 or 32-bit ARM platforms. If you’re running Linux in other architectures this is your cue to break down sobbing. 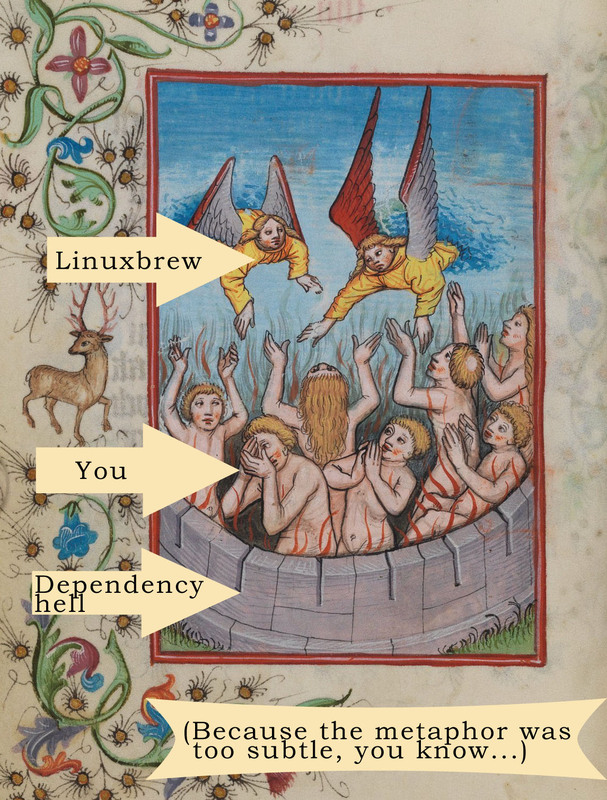 Linuxbrew won’t turn your dependency hell into a package management heaven, but it might turn it into a tolerable purgatory. As you see, I got almost lucky. Ruby and GCC are good to go, but I’ll have to install Git (and its dependencies). The trick is being minimalist. Many packages have optional features : extra commands, documentation, GUI interfaces, etc., that will fire zillions of extra dependencies. Get rid of those optionals as much as possible. I recommend a top-down plan of attack. Start with the package you want to install and try to configure–make–install it. If it breaks (and it will, it will), find out which dependency/configuration is missing and correct it. Do this recursively, depth-first, until you get everything installed. Resist perfectionism. You might spend a lot of time smoothing out every wrinkle of package-1.73.03 just to find a bit later that it breaks your installation and has to be removed to make room for package-1.73.04. This is war, kid : not a time for bells and whistles. Once you get a dependency working, move on to the next. There are similar facilities for other high-level package managers. Step 2 varies a bit from package to package, but usually consists in calling a ./configure script. Sometimes pre-configuration is involved : a call to make configure or make config, or another script, e.g., ./buildconf. Sometimes it involves cmake (cross your fingers for having autoconf/automake already installed). Sometimes there’s no step 2, all options being passed directly to make during step 3. It varies. How will you know ? Try to locate a INSTALL. * or README. * file. Usually the instructions are there. No luck ? Try browsing the official website of the package for installations instructions. Googling <package> installation instructions usually will point you to the right direction. Well, sort of. It will probably break, because one or more dependencies will be missing. Install those (and their recursive dependencies) and try again. Sometimes this is the moment when things break down for lack of dependencies (or wrong versions, or wrong settings, or the universe showing its lack of care). Sometimes the --prefix=$HOME option comes here instead of Step 2. If you set the prefixes right, that will automagically put everything in the right place, under your ~home directory. And you won’t need root permissions. Got it ? Good. I hope you enjoy typing command-line commands : you’ll be doing it all day. For extra enjoyment, get a second monitor and close the shades. And it should take care of everything. and check if everything is ok. Again, be minimalist : you don’t have to correct every tiny issue. Take a good look and make the smallest needed intervention. will install a lot of new formulas related to science, data analysis, etc. Both phases (manual dependency installations; Linuxbrew operation) won’t do you much good if your paths aren’t configured. There are at least four important paths, maybe more depending on your setup : executables (PATH), static libraries (LIBRARY_PATH), dynamic libraries (LD_LIBRARY_PATH), and include files (CPATH). The usual place to set up those is your your shell configuration file. The examples below assume you’re using bash. If that’s your case, decide whether .bashrc or .bash_profile is better for you (usually it’s the former). Remember that shell configurations are not effective immediately, only on the next start. You don’t have to reboot the system : simple closing and reopening the terminal, or logging out and back in suffices. During my installations, I faced an issue with CA certificates that I could not bypass. Many formulas would refuse to proceed, stopping during download with the error : “cURL error 60: SSL certificate problem: unable to get local issuer certificate”. Yes : I tried downloading updated certificates from Mozilla Corp. Yes : I checked my curl-config --ca. Yes : I tried reinstalling cURL. And Git. And OpenSSL. I spent, litteraly, hours trying to solve the problem in an elegant way. I concede defeat. Here’s the very inelegant solution. Be aware that it opens your package manager to man-in-the-middle attacks. That is more than a theoretical risk : it has been done. This is a huge security hole. If you decide to apply it, don’t do it preemptively, wait to see if you’ll actually get the SSL certificate problem. # with raw head calls (`curl -I`) or with actual `fetch`. And that’s it. You’re ready to proceed installing source packages. And to be a victim of cyber mafias, and of terrorists, and of tyrannical governments. First and foremost, source code relocation is not a panacea. Some things require root access, for example, driver installations, kernel recompilations, boot sector modifications, etc. You might want to check if your software require one of those before you start this whole adventure. Take a good look at the --without-* options because they are sometimes a lifesaver. Some packages have optional GUI extras. They might fire hundreds of useless extra dependencies — especially if you are installing on a headless server. Sometimes Linuxbrew breaks down for the lack of a dependency, refusing to install it, but will gladly do it if you explicitly ask for it. For example : brew install package1 breaks for the lack of package2, and all it takes is typing brew install package2 and retrying package1. Mysteries. Installation time is highly unpredictable. Sometimes a small innocent little package will require a precise version of GCC… that Linuxbrew will then have to install from the sources. Time for a tea. but be careful because that might erase innocent third parties. You might be forced to install multiple versions of the same package. That adds another nightmare layer to the ongoing nightmare, but it’s doable. Linuxbrew will usually be friendly enough to tell you what to do. opencv3 and opencv install many of the same files. Those little displays of care are the reason why I like Homebrew/Linuxbrew so much. Love breeds love : a truism even for human–computer interaction. When Mavericks launched, I scheduled doing a clean reinstall over a blank, reformatted HD. (Due to the degradation of configurations, permissions, and other metadata, a system may suffer to something akin to a long-term aging effect. A reinstallation from scratch is a way to freshen it up.) The task, however, was marked “low priority” in my To Do list. The result : last week I was forced to upgrade to Yosemite, and still no reformatting. (Possibly ?) Reinstalling Java VM from Oracle. This might just be an issue for web browsing ; maybe the VM works on the command-line out of the box : I didn’t check it. But if you type java on Terminal and nothing happens, chances are you’ll need to get it before being able to do anything interesting. The bad news : the only way I could get HomeBrew back to work was reinstalling Ruby 1.8. If you don’t have a Time Machine (how do you even survive on OS X without one ?! ), maybe you have an old MacBook stored in a cupboard ? Or an upgrade-averse friend who has not yet moved to Yosemite ? (Hint : do you know anyone who works on CS/IT ?) Get a copy of that folder and put it back where it belongs. If you can’t get your hands on that folder anywhere, you’re probably out of luck. You might be able to fish the framework out of the installer packages of an older OS X version, but just thinking about it makes me want to cry. Maybe you can wait for HomeBrew to issue a patch ? All this marathon started when I needed to install Maven on my system. 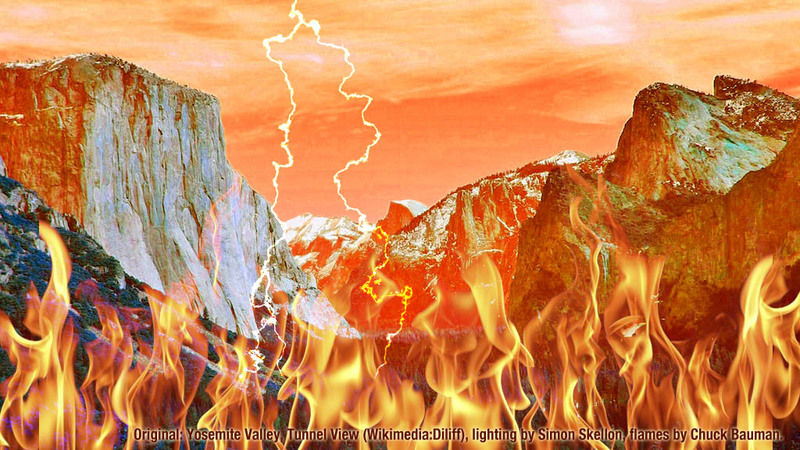 “Upgrade to Yosemite,” they said. “It will be fun,”, they said. …but if you experience the same problem, you’ll first need to check where the java_home util (it prints the path of the Java VM on stdout) actually is in your system. If /usr/libexec/java_home runs, the solution above will probably work.